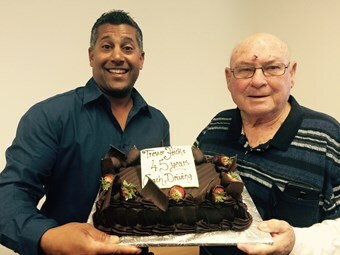 After 45 years as a coach captain, Trevor Hicks knows a thing or two about the industry. Passion and knowledge, he says, is what it takes to be a good coach driver, with a focus on helping your passengers make the most of their journey. "People want to learn about their destination, that’s why the commentary is so important," he says. "The commentary is crucial and that’s one of the things I enjoy teaching the younger guys most." The last few months have not been easy for Hicks, who is currently off work from Adams Coachlines, and recovering from a cancer operation. "It is hard being away from doing what I love, but I have to focus on my health at the moment – I should be back in action in a few weeks hopefully," Hicks says. Although Hicks plans to retire after his 75th birthday in August, he will still help out at the company in a driver training and mentoring capacity. "I absolutely love driving and will miss it a lot," Hicks says. "I enjoy talking to the people from all over the world and teaching them about our beautiful country. "I have met people from every country you could think of, and even some I didn’t know existed." In an illustrious career, Hicks has worked for some of Australia’s most iconic coach companies. Starting out as a long-haul truck driver, Trevor made the switch to coaches in 1970 with Ansett Pioneer, driving mostly the Perth to Darwin route, and sometimes in Tasmania, until 1988 when he moved to Swan Gold Tours. Hicks’s first stint with Swan Gold Tours in mainly metro driving lasted a year before returning to coaches with Greyhound where he drove express services for the next three years in Western Australia and South Australia. During his time with Swan Gold Tours he made an impression, and was enticed back to the company. "I met up with Maurice Silvestri, manager of Swan Gold Tours at Perth Airport," Hicks says. "He asked me what I was doing now Greyhound was shut down, as I was one of 15 drivers made redundant." Hicks was offered three weeks work at Swan Gold Tours, which turned out to be 16 years, leading up to Adam Barnard’s buyout in 2008. "It’s people like Trevor who have given their lives to this industry and that has to be recognised," Barnard says.